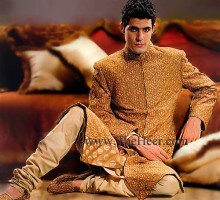 Brown sherwani having rich embellishments all over the sherwani. Comes with cream kurta, shalwar or churidar pajama.Made in Pakistan. Click the button below to add the SW770 Brown Jamawar Sherwani to your wish list.